I was sitting in the kitchen of a shared apartment in Toronto eating some homemade ribs. Across from me and feasting on his own plate of ribs was Kyle, a friend from college and my only connection to the city. Kyle had moved to Canada to follow a job with the Salvation Army. The ribs had been made by Heather, the girl who lived downstairs. Alex lived in the shared apartment. She has almost the exact same job as me: operations management for a real estate office. In talking about work we found that we shared the same work-based joys and frustrations, and that real estate wasn’t all that different in Canada than it was in the U.S. The final member of the group was the only boy roommate, Mike. My friend Kyle dosen’t actually live with these friends, but they didn’t mind opening their home to me when Kyle said I needed a place to stay. As we scarfed down some of Heather’s guacamole another friend came over and the whole group wasted the night away talking in the living room. The subject of what I would be doing the next day came up. “So what kind of traveler are you?” Mike asked. Mike explained that it’s the kind of thing I ought to know about myself, and if I could figure it out it might help him find me some interesting ways to spend the day. After a bit of prodding and speculation we determined that I was a people and knowledge traveler. I liked to learn and I liked to meet new people. Mike helped me plan out and google map the entire day. He even gave me his phone to use for navigation since I couldn’t use mine in Canada. One of the girls offered me a pass for the bus. Mike made arrangements with some friends to meet me at various points. Canada is so nice. First on the agenda was breakfast at Tim Horton’s, a popular Canadian chain restaurant. Not the Tim Horton’s near Bathurst Street though, the Tim Horton’s on Spadina Road. I grabbed a muffin and smoothie and meandered through the University College campus, heading towards Kensington Market. I think there is one thing for every traveler in every city. There’s one place, one food, one experience that seems unique to that city. And when you ask a fellow traveler what you should do while you’re in town, they will tell you – you have to ______. In San Francisco, you have to ride a cable car. In Philadelphia you have to have a Philly Cheesesteak. 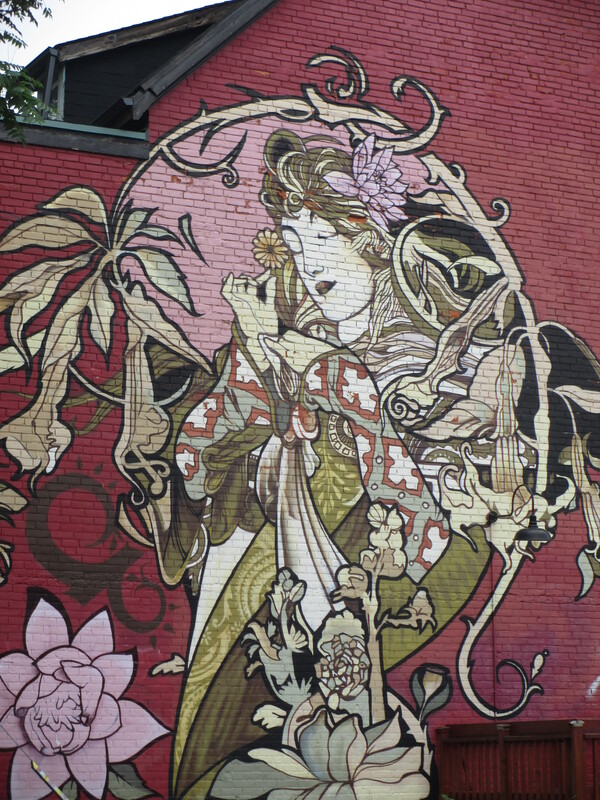 For me, for Toronto, you have to visit Kensington Market. And may I suggest that like myself, you go there at the completely wrong time of day. 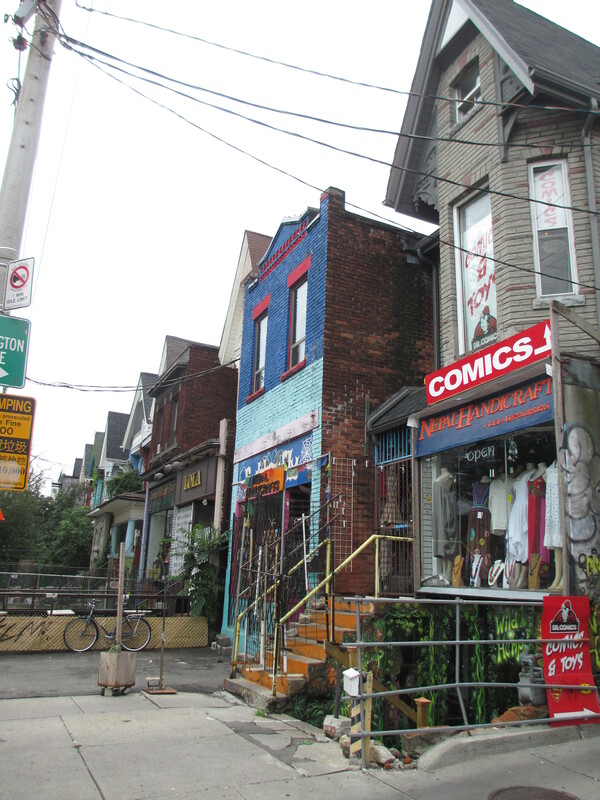 Kensington Market is a residential neighborhood turned into a business district. Old houses sit together in a line, their living rooms turned into clothing shops and their front porches filled with handmade wind chimes. Artistic graffiti adorns almost every surface. 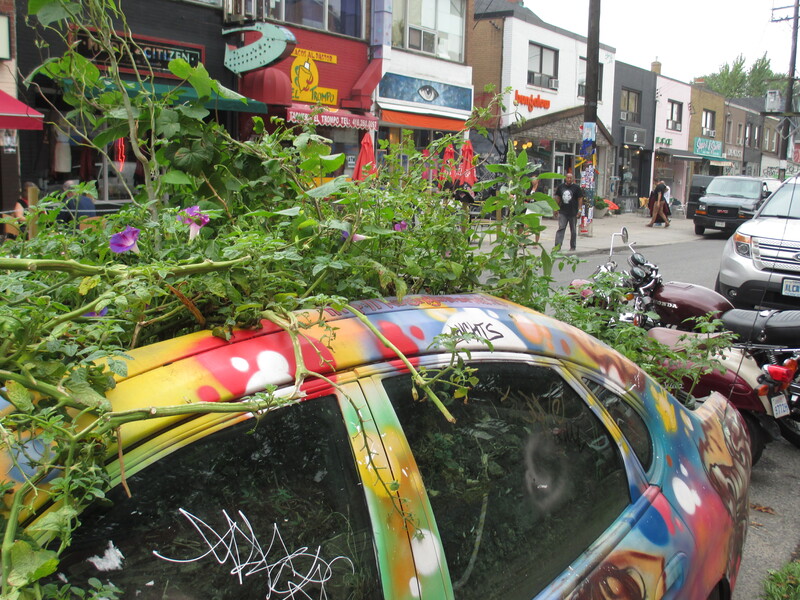 There’s a old car that’s been turned into a garden. Hippie shops have signs in their windows advertising incense and soap and palm readings. I had arrived too early. The market wasn’t alive yet, it was merely waking up. The fruit and vegetable stands were open, but they had few customers. The clothing vendors were sweeping off stairs and setting out A-frame signs. I walked through Kensington and watched the day begin. I imagined what it would be like in just a few hours time: sidewalks full of tourists, cars honking to make it through the streets, vendors yelling out their wares or ringing up customers or picking up messes. There was a lot of life about to happen in Kensington, and I was honored to see the quiet beginnings. 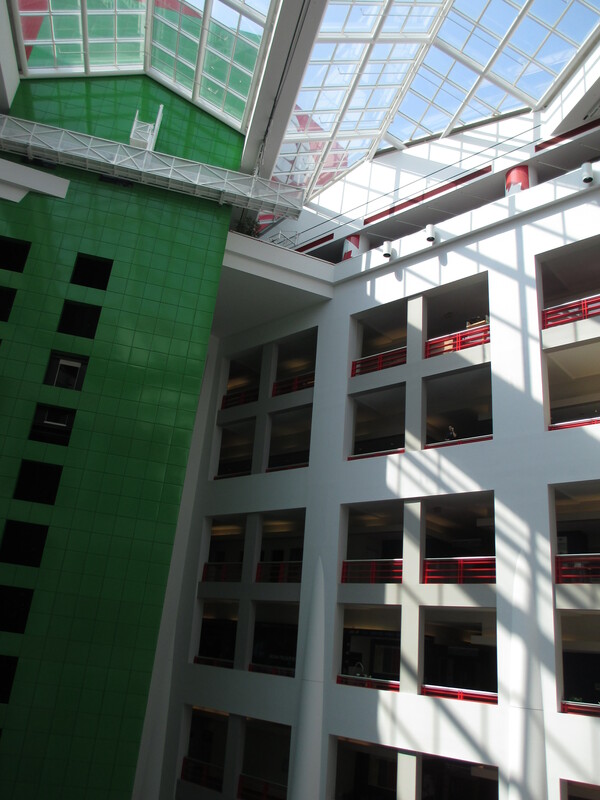 I walked down to the Canadian Broadcasting Company (CBC) to meet Mike’s friend Caitlin. She’s in her twenties and works in their web department, and as an employee she has keycard access to most of the building. We walked through a studio that was setting up for filming and overheard a professional chef as he was explaining the blocking for the show. “I’ll put the beef in the pan, then go over here to wash my hands…” It’s funny, but I never really thought before about cooking shows having blocking. From the point of view of a stage actor, the participants on a cooking show stay in basically the same place the whole time. But for the camera, the star of your show is the food. Everyone involved needs to know where the focus is and when. Caitlin got rather excited, explaining to me that the chef we walked past was a celebrity in Canada. As we continued our tour, Caitlin explained that there are rules in Canada dictating a certain minimum of broadcast television that has to be produced domestically. “Which is good … and bad,” she said with a smile. It means that Canadians are blessed with an abundance of programming made by and for their own citizens, but that the abundance is not entirely based on quality. “I don’t have a key for this room,” Caitlin told me as we approached a door, “But we can look in through the window.” I squeezed up next to her to look inside and saw a flash of monitors. Before I had a chance to ask what we were looking at, a man came up behind us. “Did you want to come in and look around?” he asked, opening the door with his key. He let us inside to a sort of entry hallway / break area. We thanked the man and he walked off, not bothering to ask why we were there or what we were doing. Caitlin and I looked ahead at a large glass wall and the dozens of people and monitors behind it. There were blinking lights and TVs playing all different programs. It was like a set from a movie pretending to be a major broadcasting corporation. A man came out of the glass room and began to fix himself a snack from the break supplies. He told us about his job monitoring the programming, and how shift work can be hard, since they have to stay up until 2:30AM for the Vancouver feed. We kept walking and I saw hallways lined with signed photos of Canadian celebrities. Mr. Dressup was clearly a big deal – a sort of Canadian Mr. Rogers. Sesame Street made a show in conjunction with the CBC called Sesame Park (they even kept the theme song: “Can you tell me how to get, how to get to Sesame Park?”). I recognized The Royal Canadian Air Farce as well as the likes of Colin Mochrie and David Rakoff. But most of the faces were unfamiliar to me. I am an American, and these were strictly Canadian Celebrities. Caitlin brought me to a sound studio where they used to do radio dramas (the CBC began as a radio network). Once again we were let into the locked studio by a friendly man who seemed unconcerned with our intentions. Canada is so nice. I thanked Caitlin for taking time out of her day for the lovely tour, and start booking it across town. I had another Kaitlin to meet at the Mill Street Brew Pub. This Kaitlin, also a friend of Mike’s, works as the distiller. The distillery is a small room encased in glass that allows restaurant patrons to watch the process as it happens. The machines inside look like they belong in Wonka’s chocolate factory. Inside the glass box it was incredibly hot, and sweat started to form on my forehead from simply standing there. 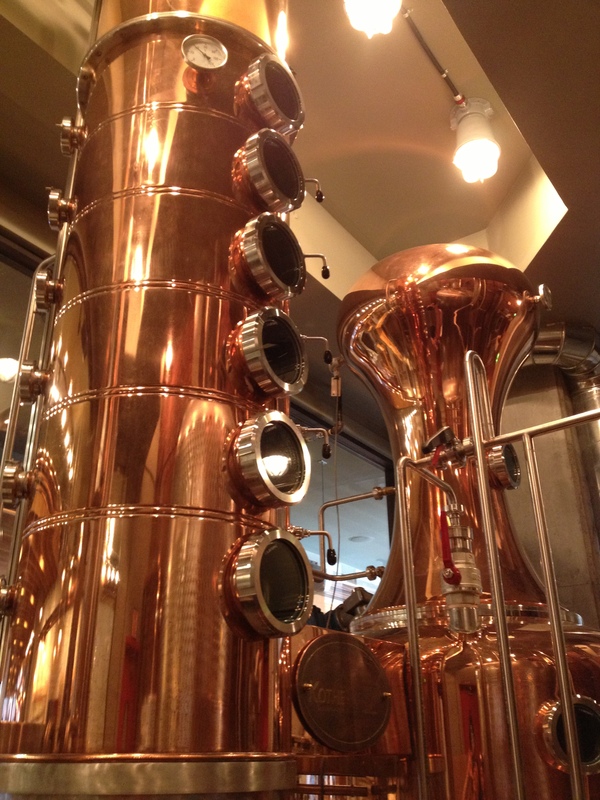 Kaitlin explained to me how they distill beer, which is a genuinely fascinating process. Kaitlin said that they’re hoping to get air conditioning installed soon to make both her and her regular tour guests more comfortable. Unfortunately any construction project for the room comes with mountains of paperwork and safety regulations. The distillery is inside a restaurant and underneath a condo building, and alcohol vapor is highly flammable. Kaitlin can’t even bring her phone into the distillery when a batch is brewing because of the spark risk. I thanked Kaitlin for the wonderful tour and headed across the street for some much needed and deserved chocolate. I puttered around the area for awhile. Mill Street Brew Pub is only one business in the Distillery Historic District. 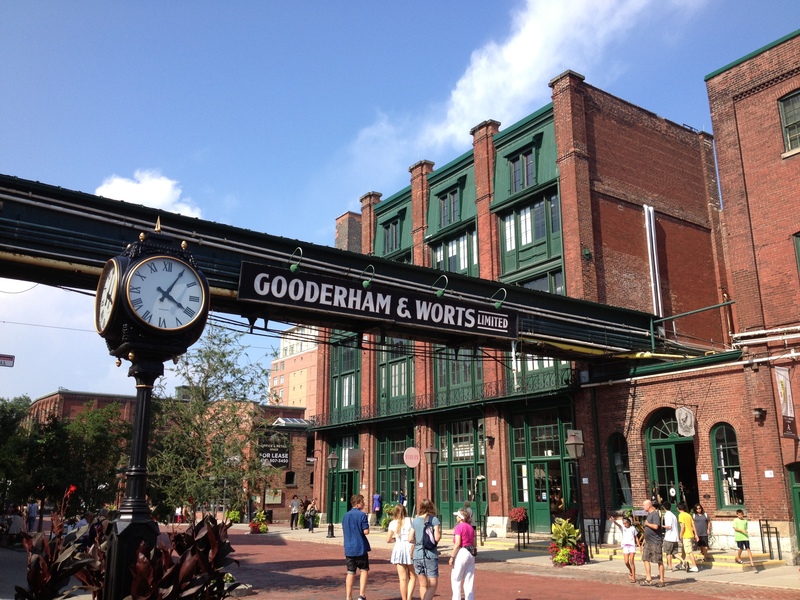 This maze of Victorian architecture was once the largest distillery in the world, and is now filled with restaurants, shops, condos, art, and street performers. It was getting late in the day and I was getting tired. 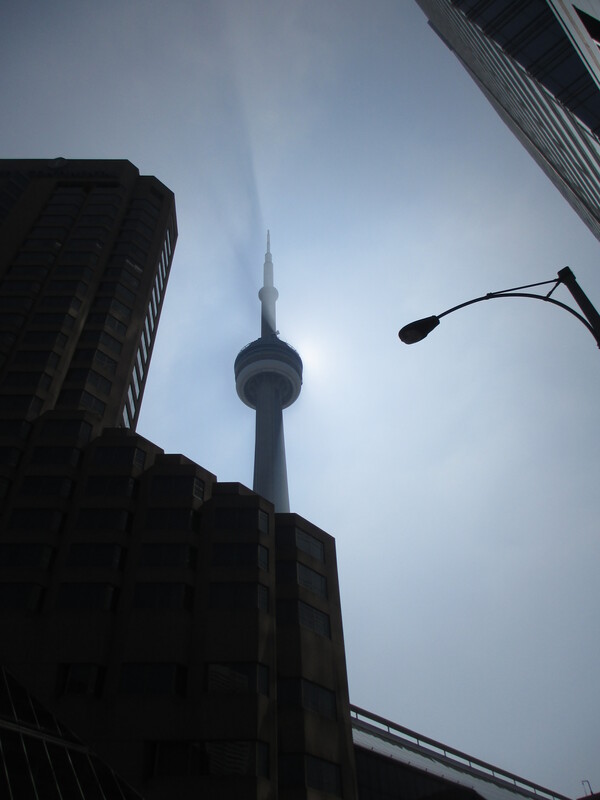 Toronto is walkable, but it’s not exactly a walking city. I hopped on a series of street cars and buses and made my way back to the house. After meeting up with some of the girls back home, we took the subway down to Pecaut Square, a park in the middle of the city that’s surrounded by office high-rises. By the time we got there the park was already filling up. 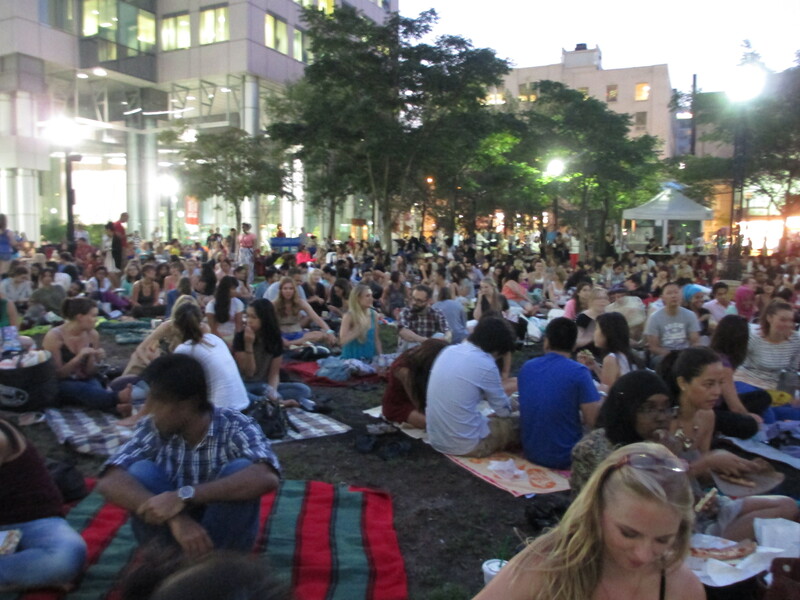 It was the final night of the summer outdoor movie festival and the grass was covered with groups of people on their blankets. 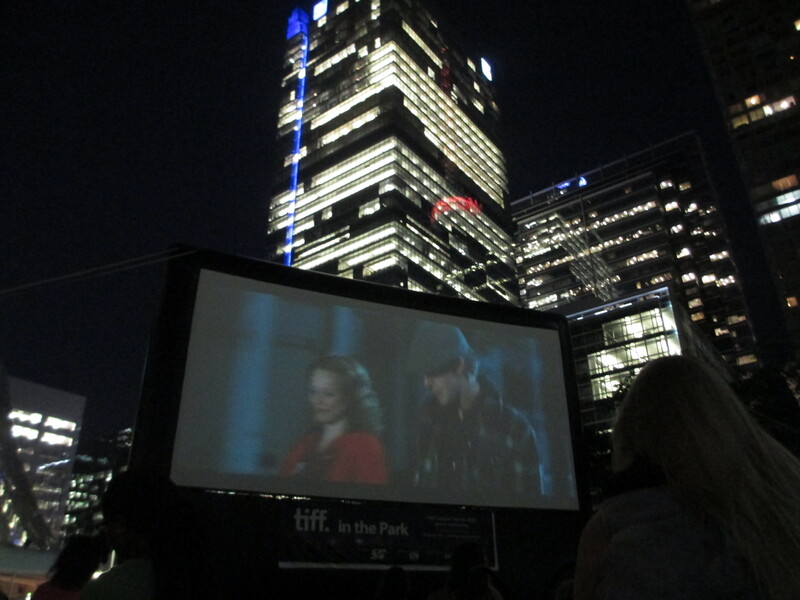 The theme for the summer had been romance, and they were ending the series with The Notebook. We took turns picking up food and an hour latter the sun was down and the movie was starting. It was a warm night and the lights of the tall buildings were beautiful against the sky. I suppose it’s because an outdoor movie feels so much like a drive-in that the juxtaposition of the huge, glistening buildings and the grass under my toes seemed so delightful. It was like someone had plopped the rural down in the middle of the urban. Kyle joined us on our blanket and he and I made jokes to each other about how much we hoped things would work out between James Marsden and Rachel McAdams. After all, he really seemed like a better match for her than that Ryan Gosling fellow. The other girls kept poking at us to quit joking around. I suppose the movie meant more to them than it did to us, since neither Kyle nor I had ever seen it before. But honestly, who could turn down James Marsden? After the film we headed over to the nearby Tim Horton’s. They had been passing out coupons for hot chocolate, and we had snagged enough for everyone in the group. Kyle picked up a box of 20 Timbits (i.e. doughnuts holes) for the group to share, insisting I had to have some while I was visiting Canada – they are a Tim Horton’s tradition. We cracked jokes and sang songs until they flashed the lights at midnight for closing. It was like being in college again. There is a stereotype that Canadians are especially nice and especially polite. My experience confirmed this prejudice completely. In talking with Kyle and his Canadian friends I was told that there are a lot fewer social pressures for young Canadians. No one in the group felt especially pressured to get married or buy a house or have kids, despite all of them being the same age as me. Mike’s friends thought nothing of taking time out of their workdays to give tours to a complete stranger. Kyle’s friends thought nothing of letting one sleep in their house. In talking with my Canadian friends about this, they all agreed that the stereotype was true, and based in the fairly laid-back way Canada address concern and responsibility. I feel like the humor and kindness of Canada that I experienced was best described in a comment Mike made my first night in town. He was telling me how Canadians were less inclined towards fear mongering and worry. I asked for an example. It was the first of three messages I received outlining the many ways in which using my phone in Canada was going to be expensive. I switched over to airplane mode as I didn’t have time to search for the data usage settings. I was in my car trying unsuccessfully to find a place to park that wouldn’t cost $20. I gave up quickly. This, I decided, would be worth it. I knew early on that I would want to visit the Canada side of Niagara Falls. Everyone I spoke to who had been there insisted the Canada side was better. They were completely right. Niagara is a giant waterfall, and the park on the U.S. side is at the top. While the view looking down from a waterfall can be nice, the top is a horrible place to see the waterfall itself. I gave the U.S. side the benefit of the doubt and found the park to be quite lovely, but I can see why few people bother. It’s not what you come to see. You come to see the Falls. The Falls at Niagara are the result of an elevation change between two of the Great Lakes. Lake Erie spills over a 165 foot drop into the Niagara River, eventually becoming Lake Ontario. 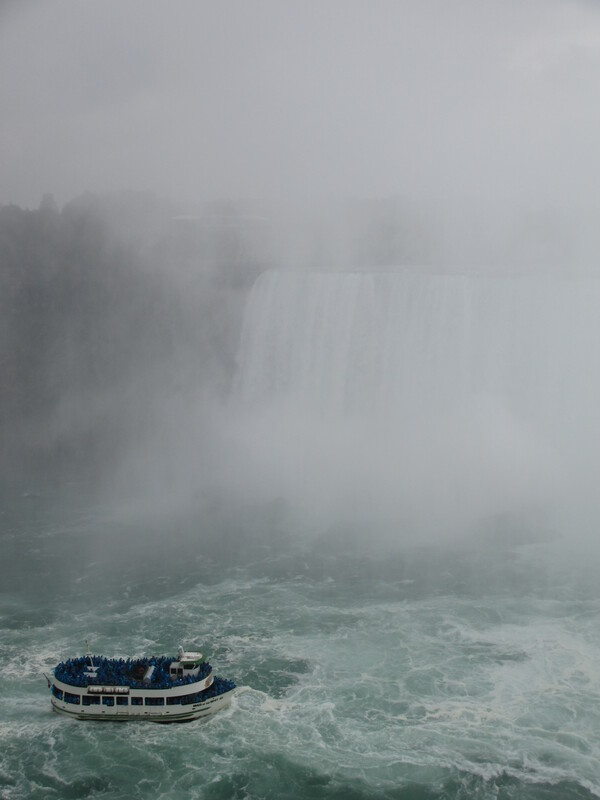 Technically Niagara is a set of three falls – Horseshoe, American, and Bridal Veil – though Horseshoe Falls is the one you think of when you think of Niagara. It’s the big, pretty, rounded one. 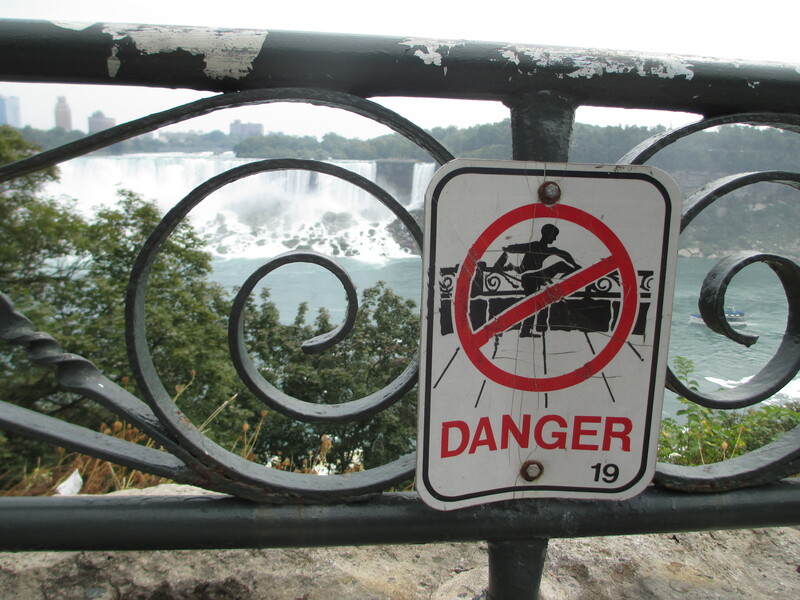 After parking in Canada, I walked along the cliff’s edge that overlooks the falls and the river. The area was crowded at all times, and the crowd was one of the most racially and culturally diverse groups that I’d ever seen. I guess Niagara appeals to everyone. I had a field day indulging in my favorite pastime of taking pictures of people taking pictures, and I watched the Maids of the Mist ferry boats make their short voyages to the base of the falls and back. I thought about getting a ticket myself, but I wasn’t sure how much fun it would be without someone to talk to, and I was already getting plenty wet just from being at the top of the falls. 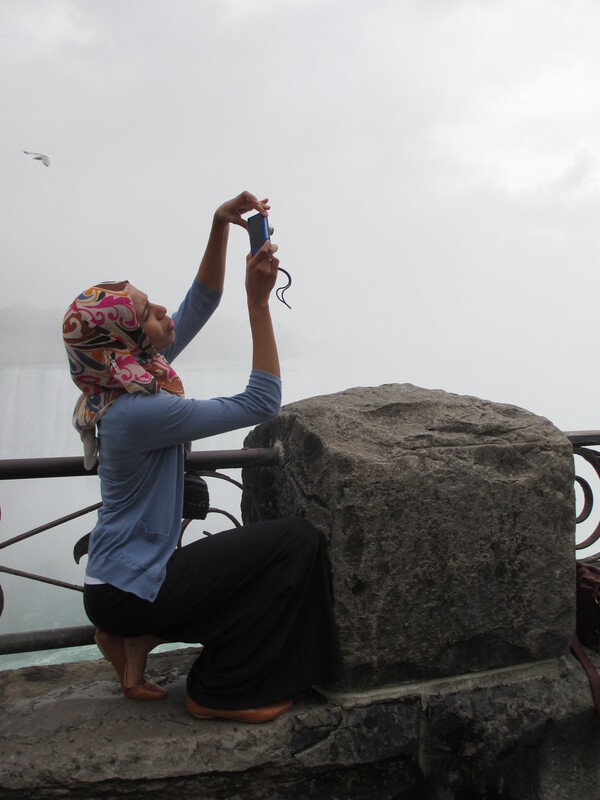 In my memory, I visited Niagara Falls on a warm, sunny day. To look at my photos, it was grey and overcast. 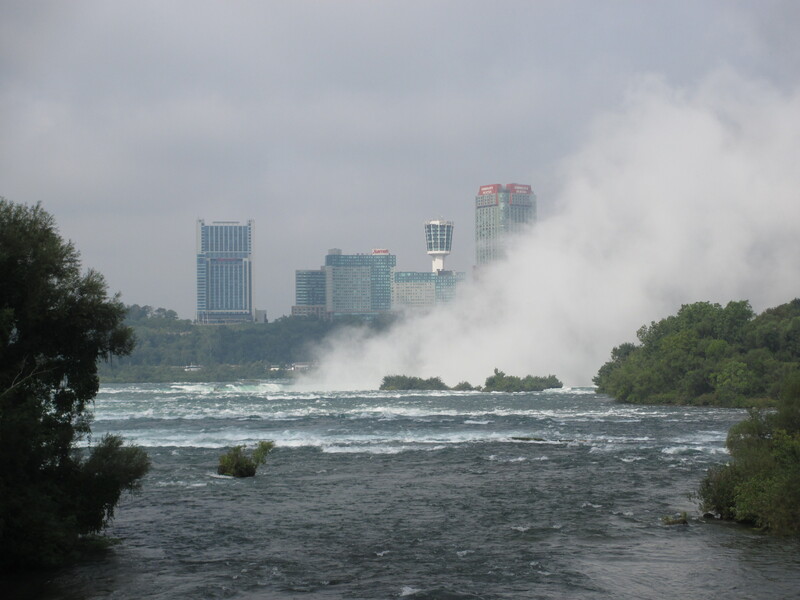 The constant pounding of the falling water creates a huge and heavy cloud of mist that radiates off of Horseshoe Falls. I’m sure some days the cloud is better than others, which is why most people’s mental image of the falls is crystal clear. Those are the days they take the postcard photos. For me, the most fascinating thing about Niagara is that it is destroying itself. The strong, constant flow of water is eroding the rock underneath, constantly changing the shape and pushing the falls further into Lake Erie. There were signs in the visitor’s center explaining the steps the American and Canadian parks departments take to slow down the erosion process. I found this rather laughable. What gall must we have as humans to try to tame such a waterfall? And to what end do we want to “save” Niagara? We want to keep it looking the way it does in the pictures, we want to keep it next to all the hotels and amusements we’ve built up around it. We want to control the thing that inspires us because it’s untamable. We humans are working to preserve Niagara for the sake of us humans. To keep it where we want it, doing what we want it to do. I’m happy to say that in general, we are completely failing at this endeavor. And for her part, Niagara seems unconcerned.